Are you looking for a great tool to incorporate in fun baseball drills? Pro Cuffs could be your best baseball hitting aids, especially youth baseball hitting aids. Our baseball training aids are great tools to incorporate into baseball drills for kids, from baseball hitting training to baseball practice drills. From little league practice drills to youth baseball hitting drills, our team at Pro Cuffs is excited to hear how our hitting aids are being incorporated into youth baseball practice plans around the country. Are you a baseball hitting trainer? Pro Cuffs has been hearing from baseball batting trainers around the country about the growing need for pro-level baseball batting aids, for students and aspiring star athletes. Our revolutionary baseball batting tools have been tested and approved on the filed, as the best hitting aids to improve performance behind the plate. As technology advances in the field of sports, the price of baseball equipment has also skyrocketed. That's why our baseball hitting aid and batting aid, Pro Cuffs, is the best tool for your money. Our team would appreciate hearing from even more baseball hitting trainers, on how Pro Cuffs stand out as a hitting aid. Here at Pro Cuffs Central, we like to recognize players who through their hard work and dedication, do things in the game that validates all the effort they have put in. The article below is from the Douglas County Sentinel and features the performance of Triston Leggett, A Pro Cuffs devotee. Chapel Hill jumped all over Haralson Wednesday evening, clinching a spot in the 2014 GHSA AAA State Playoffs. The Panthers scored four runs in the third, one in the fourth and seven in the fifth for a 12-0 win. Brandon Sattenfield was lights out on the mound. He allowed only two hits and four walks in five innings of work. He struck out five. Triston Leggett led the offense, going 2-for-4 with a double and a fifth inning grand slam. With Chapel Hill up 8-0 in the fifth and the bases loaded, Leggett, who normally is the type of hitter to spray the ball around to all fields, had the opportunity to step up to the plate and literally swing for the fence. Leggett connected on a pitch and sent the ball on a line, over the left-center field wall. Leggett finished the game with five RBI’s and two runs. Jason Rodriquez, Brandon Peterson and Jason Winslett also walked away from the game with two hits apiece. Rodriquez went 2-for-4 with a home run, two RBI’s and two runs. Peterson went 2-for-3 with an RBI and two runs. Winslett added two doubles and one RBI. Harper expressed great relief after the game. Pro Cuffs @ the Pensacola Blue Wahoos "Coaches Clinic"! Local Pensacola coaches at the Clinic. Coaches getting great advice on making their players better from the Pro Cuffs pros! DeLino, Linc and Brian share with the coaches! 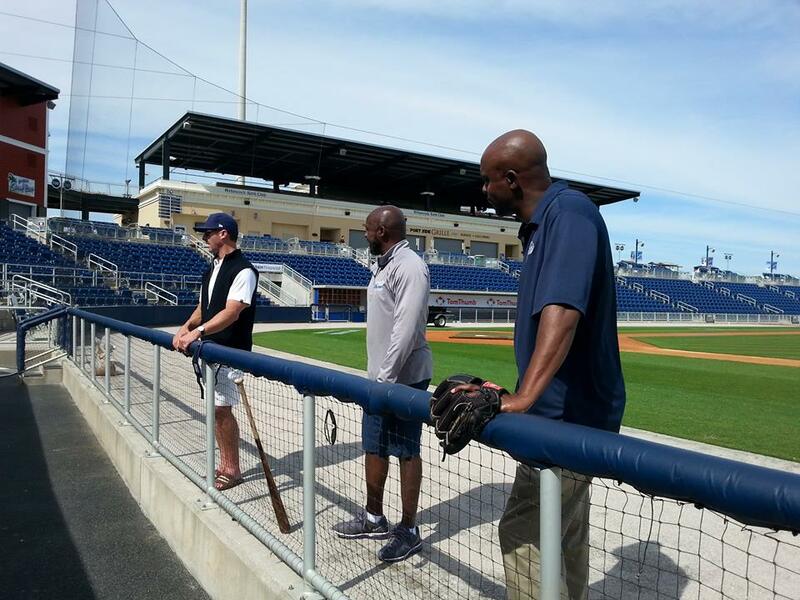 Thank you to all of the coaches who came out on Sunday March 30th to beautiful Pensacola Bayfront Stadium to participate in the first ever “Coaches Clinic” with Pensacola Blue Wahoos Club manager and Pro Cuffs inventor Delino DeShields, former pro player and MLB Scout Lincoln “Linc” Martin and Pro Cuffs principal officer Brian Leggett. The coaches that attended are from the Pensacola area and coach all levels of youth baseball and softball. We hope you are able to parlay all of your pointers into winning seasons for your teams and that you get to put the Pro Cuffs to good use! Here are a few comments on the clinic! Jason Dingler - It was very educational.... Thank you! Amanda Wood - Thank you very much. We've already put the Pro Cuffs to good use, our girls were confused at first but now understand. Remember that this process is about you! Don't let your friends, coaches, or even your parents make the decision for you. Choosing a school is one of the most important decisions you will ever make. Make a list of what you want in a college: Small or big, academic standard, distance from home, athletic success, coaching style, etc. whatever is important to YOU! Get in front of the coaches of the school you are interested in! You may be interested in a school, but they may have not ever seen you play. Go to their camps, if feasible, and get a feel for the campus, coaches, and environment. Call the coaches! Recruiting has changed in the sense that it is tougher to build relationships with the athletes due to committing so early. The coaches have restrictions on when they can call you but you can pick up the phone and call them at any time. Invest in your future and ask questions that you want answered. Set attainable goals! Not everyone can get a full ride to a SEC school but that is ok! Know that schools are looking for specific positions in specific graduating classes. There are SO many schools out there to choose from and you can be happy at a number of them. Research your options: JUCO, division 2, d3, NAIA and don't give up on your dream. Academics!!! Often times athletes get so wrapped up in their sport they put academics on the back burner. Remember that you are a student first and athlete second. Getting good grades only increases your chance of a better scholarship and more looks. Remember that this is a FUN process and most importantly that it's all about YOU! Amanda Williams is a National Pro Fastpitch (NPF) All Star playing with the Chicago Bandits, Rockford Thunder and the Tennessee Diamonds. She is a former four-year starter in center field for Marshall University and also helped in the coaching department for the Thundering Herd. There are a number of little things that can make a difference in being called safe or out or making the great play and getting the win. Our game is a game of inches and seconds. Listed below are three "Little Things" that can make a difference. Pick up the ball with your bare hand: after you misplay a ground ball, pick the ball up with your barehand. Often times I see girls pick the ball up with their glove after a mistake only to get the ball out again. Pick the ball up with your barehand and go directly to your throwing form. Another common mistake is to go back to the glove after we pick the ball up barehanded. This could be the difference in getting the out or having an error in the books. Lean at first base: when base running and running to first base on a single be sure to hit the front of the bag and lean as if you were a track runner at the finish line. This propels your body forward and also gives the view to the umpire that you may have “beat” the throw on a close play. As John Wooden once said, "It's the little details that are vital. Little things make big things happen. " Amanda Williams is a National Pro Fastpitch (NPF) All Star playing with the Chicago Bandits, Rockford Thunder and the Tennessee Diamonds. She is a former four-year starter in center field for Marshall University and also helped in the coach department for the Thundering Herd. The coach has 5 balls in hand and athlete stands about 5 yards away, facing the coach. Each ball is thrown in a different direction and after each catch is made receiver gets rid of the ball quickly (off to the side) and gets ready for the next ball. Coach should toss the ball in a 15 foot radius varying the types of tosses: shoestring, line drives, and over the shoulder catches. With advanced athletes challenge them with diving catches. This drill promotes agility and the ability to change direction and cover ground. Pro Player and Pro Cuffs™ staff member Amanda Williams shows off one of her favorite drills for outfielders!